My nephew was born when I was 16 years old. At the time, I felt like I was the youngest girl to become an aunt and so they named me "titi" which is short for "tia" (aunt in spanish). It's like "little aunt". 11 years later, they still call me "titi" but now I have 6 nieces and nephews - 2 from my sister, 2 from my brother and 2 from my husband's side of the family (I somehow convinced my non-spanish niece & nephew to call me "titi" too! :) ). Anyways, for the last few years I've been trying to use their birthdays and special events as an occasion for them to request for me to bake them anything they want. The first year this concept was very challenging as I barely knew the difference between a tsp and a Tbsp (I finally learned that the "b" actually means something and isn't just a typo on the handle.. and that the T is usually capital in the tablespoon designation...ha). After lots of trials and errors, I've come a LONG way in both taste and presentation! 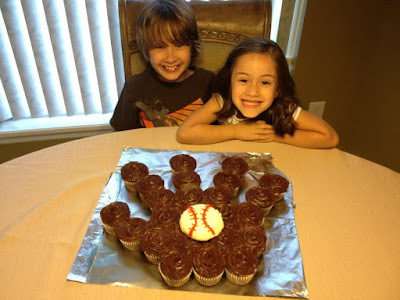 Vinny (my sister's son and the first of the bunch who taught me how to be an auntie/titi) just turned 11 last week and he asked me to make him a baseball glove out of cheesecake this year. I'll have to go back in time a few years for you to really understand what "a baseball glove" means for him in the world of desserts. Vinny is a hard-core baseball fan and I still remember when he was just a toddler (and I was still in my teens) and I'd visit him and he'd make me watch The Sandlot on repeat with him. I didn't really understand this obsession until a few years later when he was playing on an actual baseball team every.single.weekend.of.the.year! Instinctively, Vinny asked me to make him the same thing this year but he wanted the cupcakes to be cheesecake. Well, the hormone-driven auntie that I am was in the mood for HEATH BAR in her cheesecake so I found a recipe here that was centered around heath bar. I seriously considered making the presentation a baseball glove (just like he asked) but then realized that what brings the cupcakes together is the icing and icing on top of cheesecake was just unheard of. I couldn't come up with a way to arrange the cupcakes with a topping that didn't ruin the actual cake... so I nixed the glove idea and went running with the added-heath bar. Step 2 (Friday 6pm) - prepare your pan with the crust. I actually forgot to take a picture of this step but it pretty much looked something like below. Brad crunched up a bunch of graham crackers in a gallon-sized ziplock bag for me, I mixed it with melted butter and I spread/mashed it into the spring-form pan. The only thing missing is the parchment paper that I used to layer the pan so that it wouldn't stick. Step 3 - (Friday 7pm) layer your cheesecake filling with the Heath Bar bits! After I put down the crust, I poured half of the cheesecake batter into the pan and then generously sprinkled Heath Bar bits over it. Then, I poured the rest of the batter over the Heath Bar bits. 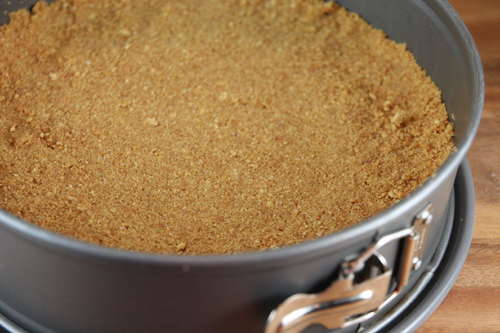 Step 4 (Friday 7pm) - place your cheesecake into the oven and bake in a water-bath. This was a new thing for me! I didn't realize that some desserts baked/cooked in a "water-bath" .. this allows for there to be moisture in the oven while baking and possibly prevents them from being "dry"? I'm sure there are more technical reasons why people use water baths for baking certain recipes but those two were good enough for me. from the kettle into our roasting pan. Step 6 (Saturday 5am... yawn!) - "make it look pretty". We removed the parchment paper and put it on a cake-round made out of cardboard box and covered with aluminum foil. Let the cheesecake sit in the refrigerator until its ready to eat.